Place the tomatoes, garlic, and ancho chile in a saucepan. Cover with water, and simmer over medium-high heat for 10 to 12 minutes, until the tomatoes are completely cooked through and ancho chile is rehydrated. Transfer the tomatoes, garlic, and ancho chile to a blender or food processor, along with 1 cup of the cooking liquid, the white onion, and 1 teaspoon of the salt. Puree until smooth. Heat the oil in a large soup pot over medium-high heat. Add the pureed tomato mixture and cook for 6 to 8 minutes, stirring occasionally, until it darkens in color and thickens in consistency. Meanwhile, rinse your blender or food processor, then add the pinto beans and 2 cups of their cooking liquid (or water, if using canned beans) and puree until smooth. Reduce the heat to medium and stir the bean puree, broth and the remaining ½ teaspoon of salt into the thickened tomato mixture. Simmer for 10 to 15 minutes, or until the soup has seasoned and has a creamy consistency. Taste for salt and add more if needed. Turn off the heat, as it thickens quickly. 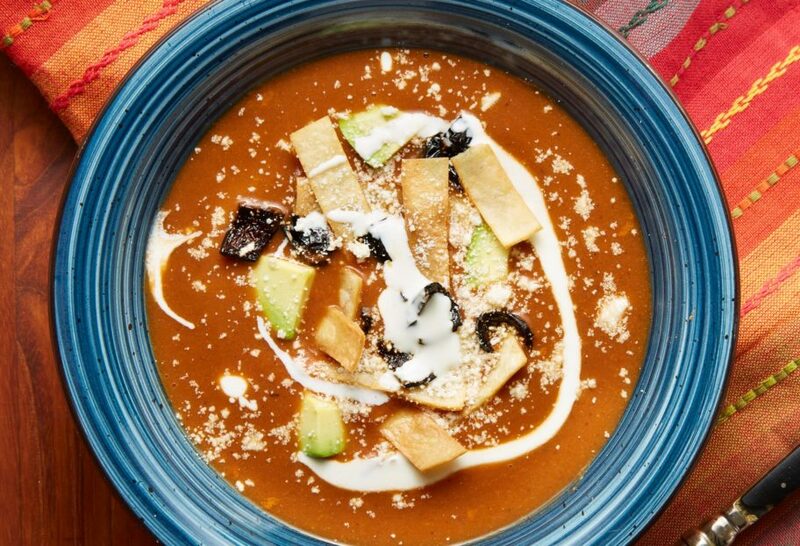 Ladle the soup into bowls, drizzle with a tablespoon of the cream and top with some cheese, a handful of crumbled tortilla chips or tortilla strips, a few fried ancho chile crisps and some diced avocado. You can also place the garnishes in bowls on the table to let your guests decide how much of each garnish they want to add to their bowls. The soup itself may be cooled and stored in a tightly sealed container in the refrigerator for up to 4 days. Because this soup thickens a bit as it cools, you may need to add some chicken broth or water to thin it out when you reheat it. This is the second time I made this soup. My husband and I love it. I did add a second ancho chili and 1/2 teaspoon of garlic salt. It was more tasty for us. Thanks so much for the recipe. I’m so glad you adapted it and made the recipe your own, Cecilia! I am a gringo that likes to cook for my wife’s mexican vegetarian relatives, I omited the chicken broth for veggie. I also made the beans from scrath in my instsa pot. It was a big hit, and everyone wanted the recipe. Thanks! I don’t track nutritional information…. I cooked your “Tarascan Soup” today and I love it. I even found the Mexican Style Cream and the Queso Duro Blanco which added to the great flavor. Awesome! I’m so glad you enjoyed it, Allen. I love soup and after -50 below wind chill in Chicago this week, this is going to hit the spot…thank you Patti..
Look forward to making this for my 94 year old Nana who is from Guadalajara and still loves her chile’s and beans! My husband and I love watching your show and we recently got my Nana hooked. She now records it and says watching your show reminds her of home ☺️ Thanks Pati! Say hi to your Nana for me, Ondrea!! Excelente! The flavor was absolutely delicious and I thank you for a wonderful recipe. I made this again but I used home made beans and homemade chicken stock!! Wow, the flavor was out of this world! It was better than the first time! Omg! Thank you for sharing this wonderful recipe, we love all of your recipes! They are all keepers! Thank you for your dedication to educate us about this wonderful cuisine! Thank YOU Martha for giving my recipes a try and for your kind words! Made this tonight. Turned out delicious. gracias Pati. I’m glad you made the recipe your own! Omg! Wonderful, flavorful, easy, move over tomato soup! Highly recommend for everyone to try. Next time I make homemade beans I will set aside some in the freezer label for this soup! It was a hit for lunch today’s menu. Thanks Pati. I’m so happy to hear it was a hit, Martha. Looks easy to make and delicious. I hope you give it a try and love it, Alicia. Pati, just wondering if I can blend 2 Serrano chilies with the tomatoes onions and garlic ? If you want more heat, go for it, Randy! Delicious soup, used canned skinned plum tomatoes and canned pinto beans. Yum! So happy to hear that it will be a favorite, Ruth. HI Pati! I’m making the soup for the 1st time. But I was thinking about using Peruano beans. Would this be good too? Thanks! Sure, Leslie! Have fun making the soup. Hi, Pati, I am out of pinto beans, but I have black beans, good mother stallers, and ojo de cabras. May I substitute one of them for the pintos? Thank you! Oh so glad you made the recipe your own, Robert! Made it for lunch today and it is so easy with canned pinto beans. I used one ancho and it could have used two. Next time I will remove the tomato skins before putting them in the blender. So glad you had a yummy and easy lunch, Fred! Omg, I made this today and it was so good! So happy to hear this, Robin.